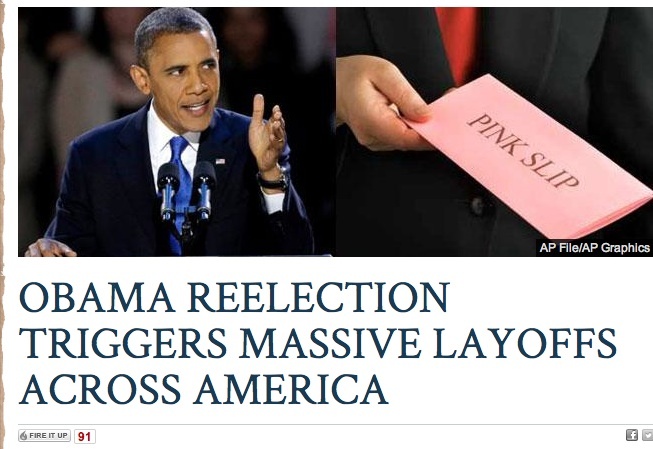 Fox Nation joined the Fox News Sore Losers Club today with a blaring - and misleading - headline: OBAMA REELECTION TRIGGERS MASSIVE LAYOFFS ACROSS AMERICA. But it turns out the facts are well, different. The coal CEO laying off workers is the same one who forced his workers to attend a Romney rally in August. Those workers had to forgo a day of pay in order to attend the rally. In the past, (CEO) Murray has also forced his workers to make campaign donations to Republicans. There are hiring and firings at firms all the time, and Fox presented no evidence that these layoffs were either related to the election or unusual in any sense. ... ManyCEOsthreatenedtheir workers with layoffs if Obama won the election. One of the most prominent, Florida timeshare mogul David Siegel, instead gave his workers a raise after Election Day. 2013 may be a very busy year for the EEOC. Applebees and Papa Johns said they’ll lay off workers if they’re not exempted from Obamacare by a certain deadline today. If they go through with it, will Fox News show the integrity to hold them accountable for mass layoffs because they didn’t get their way on healthcare? Oh, wait- of course they won’t. This crap will last a few days, and then they’ll be merrily skipping to another ‘breaking’ news story that is critical to the president. Meanwhile, the lives of their base will be getting incrementally better because we did ALL the hard work of saving the country, and we’re compassionate enough to allow them to live in it. Did we really expect a “Thank-you!”? Many CEOs threatened their workers with layoffs if Obama won the election.